Note: While I haven't had a chance to review this book, it comes with an endorsement by one of my favorite storytellers Walter Wangerin Jr. I'm looking forward to adding this book to my Christmas collection. I think will probably be one of those books that you pull out each Christmas, when you are in need of a dose of cheer. 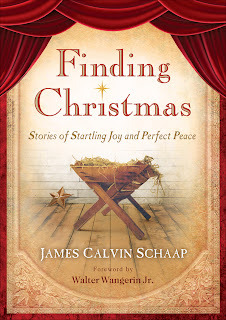 James Calvin Schaap, a professor of English at Dordt College and president of the Chrysostom Society, has created a book "Finding Christmas: Stories of Startling Joy and Perfect Peace" just in time for the holiday season. Schapp, the award-winning author of twenty-two books, weaves together a story that uncovers the grace, joy and love of the season through seven heartwarming tales of miracle moments in a messy world. Through the collection of contemporary Christmas stories, readers will be reminded what grace looks like--and where to find it. "Jim Schaap knows our lives. He re-fires our memories. He draws us into settings familiar. He causes us to inhabit the worlds of plain folk struggling with the problems of an ordinary life--and he makes it all so very, very important. . . . Schaap writes sacred mystery into our common lives." --from the foreword by Walter Wangerin Jr.
Download a PDF Excert, by clicking here. Note: As a freelance journalist, I am often provided a copy of the books to review by Revell, a division of Baker Publishing Group. For this post, I was NOT provided with a book. All information is provided free of influence - just in case you (or the FTC) were worried about this detail.